As church bells sounded across Britain on Armistice Day, November 11, 1918, my family celebrated the fact that, by some miracle, all six brothers shown in this photograph survived the Great War. Second Lieutenant Mick Michael, King’s Royal Rifle Corps; Leading Aircraftman Joe Michael; Sergeant Harry Michael, 40TH Royal Fusiliers; Sergeant John Michael, Royal Army Service Corps; Private Maurice Michael, Manchester Regiment. And, the youngest of the six, my grandfather, Rifleman George Michael, Queens Westminster Rifles. I don’t usually post, blog or tweet about politics. Political discourse has become frighteningly tribal in the last couple of years and I believe there should be some tranquil public spaces immune to the virus, especially in a blog dedicated to fiction and entertainment. This blog is to be no exception. However Britain’s decision to quit Europe, the growing acceptability of vilifying “the other” in our midst, the refusal of FIFA to permit British footballers to wear poppy armbands, and my own family history have together combined to produce this reflection. My father’s family left Cordoba in what is now southern Spain in 1492, Jewish refugees from the Spanish Inquisition. I must assume they were, at least in the fifteenth century, devout Jews, preferring to flee what had been their homeland for hundreds of years rather than face forced conversion or auto-da-fé (burning at the stake). They landed in the East End of London, where they remained for the next 450 years, contributing in an undistinguished way to the commercial and cultural life of the city and, finally, integrating fully. By the twentieth century they wore their Judaism lightly and considered themselves Londoners, albeit with a Jewish cultural identity. 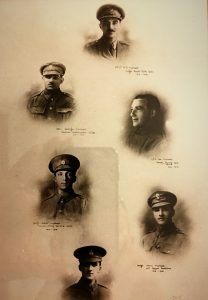 All six brothers volunteered to fight during the 1st World War. Two of the eldest found themselves in the same theatre of war, Salonica, Greece, during the Jewish High Holy Days, and for a few days were billeted with a Jewish Greek family named Cohen which also had three sons, two of whom were in the Greek Venizelist army fighting Germany and the Central Powers. The friendship created between the four young soldiers lasted the duration of the war and continued thereafter when the Cohen brothers, now named Jacques and Nico, moved to Paris between the wars. After the 1st World War the families continued to keep in touch. All those young enough to do so fought again in the 2nd World War. When I first met the third brother, Michel, I was astonished to find that he spoke French not with a Greek accent but with that of a Glaswegian. He had not been in Thessalonica during the 1st World War. The Greek monarchy had been formally neutral but de facto pro—German and Michel, a hotheaded political young man, had wanted to fight against the Germans. He had run away, hidden aboard a cargo steamer, and landed up in Glasgow, where he joined the Black Watch and fought with the Scots in northern Europe. He was in Paris when war broke out again, and became an organiser in the FFI (the French Forces of the interior – the Resistance). At the end of August 1944, two days before the German garrison surrendered Paris to the Free French and the advancing Allies, he watched as his wife and daughter were captured by the SS and shot dead on the street. After the war, when all the men were again demobbed, the friendship continued in correspondence. My parents married in 1949, and took the boat train to the south of France for their honeymoon. They knew no one in France, but my father was given the address of Nico Cohen in case of emergency. On the return journey my mother suffered a bad bout of flu and could travel no further than Paris. They got off the train and my father found a telephone to call the name on the piece of paper my grandfather had given him. 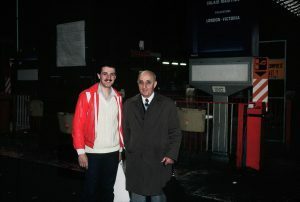 How he managed to communicate the problem remains a mystery, because my father has never spoken a word of French or Greek in his life, but within a short while Nico Cohen had arrived in his old Citroen, collected my parents from the station, and taken them to his flat. There he and his wife, Odette, gave up their bed to the newlyweds. The Cohens slept on the couch for a week until my mother was recovered. Thus was formed a second generation of friendship between a Greek/French family and an Iberian/English family. Letters continued to travel backwards and forwards across the channel over the next 25 years. Nico was particularly fond of Marks & Spencer T-shirts, underwear and marmalade, and every now and then a parcel would be sent to Paris. In return, several unlabelled bottles of red wine would periodically be delivered to London, the produce of a vineyard in which Nico had a share. In 1973, at the age of 18, I was about to go to university when my first serious relationship ended, and I decided the best way to mend my broken heart and forget the young lady concerned was by deferring my place and travelling for a year. Realising with some disappointment that the French Foreign Legion was unlikely to accept me, I decided to take my entire savings of £50 (presently worth just less than £600) and travel to the nearest capital city, Paris, and see what came up. I spoke poor O-level French degraded by two years of disuse, and I knew no one in France. The only assistance my parents could give me in case of emergency was a scrap of paper on which were written the names Nico and Odette Cohen, and an address. At that time there was a bureau at the Gard du Nord to place students who arrived in the city in appropriate hostel accommodation, but I was unlucky. No beds could be found for me on the day I arrived, having made no plans whatsoever for my first night, and I was given the choice of a park bench or a room in a hotel in the 15th arrondissement. I chose the latter (you will have suspected that a young man who needs his creature comforts was never likely to have been happy in the French Foreign Legion). Only after my first night did I appreciate that the rooms in the small hotel were all, with the exception of mine, used throughout the night by prostitutes. The room I occupied was immediately next to a large flashing neon sign which put the punters off their stroke. More about my first few weeks in Paris will be the subject of another blog. After four weeks in France and most of my money gone, I had been unable to find a job or a flat. Not only was my French poor, but I was a very young and innocent 18-year-old who looked barely 16. In retrospect it’s hardly surprising that no landlord or employer was prepared to take a chance on me. Eventually I had no choice but to phone the name on the piece of paper. I fully expected to be packed off back to London with my tail between my legs. I called, and Nico arrived at my “working girls’ hotel” later that day. He was a little man, no more than 5’6” in height, wearing a beret and a raincoat with a turned-up collar. He was exactly what I expected Commissaire Maigret to look like. I knew nothing of his background or the fact that he had been born and grown up in Greece, but he spoke French very fast and, at least to my ear, had no accent except that of a Parisian. He was scandalised that a teenager had been allowed to run around Europe on his own without a proper home or parents to care for him, and he promptly took me under his wing. I had to resist hard the suggestion that I should live with him and Odette, and so he set to finding me a job in a relative’s textile business. Having secured a job working in the warehouse where I found myself amongst a group of other non-Anglophone foreigners, he telegraphed my parents and insisted they came over to countersign a lease of a tiny flat he had found in the 19th arrondissement just opposite the Parc des Buttes Chaumont. During the nine months I lived in Paris, Nico became my adopted grandfather, making sure I ate a proper Sunday lunch every week in his tiny flat, trying, in vain, to teach me something about wine, and keeping an eye on me from a distance via his relative’s fierce wife who ran the textile business in a manner of which Napoleon would have been proud. He remained my friend for the next fifteen years until his sudden death, making mine the third generation to enjoy the friendship of this remarkable Greco-French family. My books are about alienation and people who don’t fit in. Charles Holborne, the antihero of The Brief series, faces daily prejudice, anti-Semitism and class prejudice. He wants to be accepted, but is not. Whereas in British society it used to be the Jews, now it is the Muslims. The European Union was a deeply flawed project but it nonetheless brought 28 nations of Europe together in a way which had never occurred before. Whatever one thinks of the overall project, its underlying themes were of cooperation and shared democratic values. It took the position that what unites us as humans is greater than what divides us, and in allowing so many Syrian refugees into Germany, Chancellor Merkel put those principles into practice. It might have been a mistake in political terms but, in my opinion, it was undoubtedly right in human terms. It spoke to the best we can be, and not the worst. Globalism and the birth of global terror are making people afraid again. Brexit, Donald Trump and his Mexican wall, Marine Le Pen – all are just examples of what can happen when politicians prey on the fear of “the stranger”. The story of my great-uncles and their friendship with the Cohen brothers, all immigrants at different times, and their willingness to fight for a unifying human cause, tells me we can be better than that. Hi Deborah. Glad you liked it. I thought it would either sink without trace (the equivalent to talking to oneself while in the loo – I do a lot of that) or create a political argument, but the response has been very heartening. Evocative and inspiring. I would love to spend more time following this bright-eyed young man on his wayward adventures in Paris. Potential for a brilliant script. Thank you for sharing your lovely story! Thanks Samantha. I have promised myself for some time that I will write about my Parisian sojourn, and I think I shall now have to do something about it. This is a fascinating story and a very readable blog. Looking forward to the next one. Ta, Ruth. I’d be interested to see what your OH thinks. Vince and I once used the bureau in the Gare du Nord and spent a night in a similar establishment – it certainly gave us something to talk about the next day! It’s lovely to read other people’s family stories especially ones that highlight the goodness in people. Despite all that is happening in the world I live in hope that goodness will overcome the racism, religious intolerance and bigotry. I completely agree. I think that’s why I like Dickens so much. Despite rapacious landlords, the Law’s delay, corruption, poverty and vice etc, it’s the kindness of ordinary people which usually shines through.